Life can be unpredictable; no, hypnagogic—like a dream. Stallworth took his cue from a series of events set in motion when on a whim he wrote a note in response to a solicitation from the Klan in the classified section of one of the two town newspapers, and received a letter from a Klan organizer. Stallworth accepted the invitation from the organizer to meet up, and a strange, wonderful sting was born. The mind boggles at the sheer insanity of it, and maybe imagines some kind of make-up job, like the ones in White Chicks (2004) that allowed the light skinned Shawn and Marlon Wayans to act as two young black men who make a zany decision to pass as blonde white women. But that’s not how Stallworth’s story went, and it’s not the tone of Lee’s film. 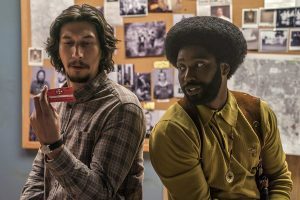 In making Blackkklansman, on the whole, Lee stuck with the incidents Stallworth recounted and with the tone of the book, which was that of a serious, dignified young black man, with the often conflicted feelings of pride at being on the force, and dedication to making a difference for his people, who are often harassed and worse by the police. But he made a few changes. Lee kept the name of the memoir’s author, but altered the names of the police Stallworth worked with, and the Klan members he bamboozled, and he tailored some of the incidents. In the movie Stallworth calls the Klan to make the first contact, an adjustment that slyly re-enforces Lee’s ridicule of the Klan’s racist belief that inevitably people are racially marked by their speech. It’s no trick at all for Lee’s Stallworth to present himself as white over the phone. 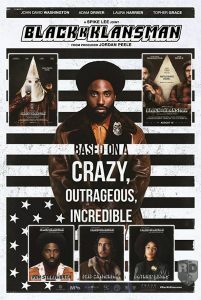 In the movie, Stallworth’s first contact is with the president of the Klan chapter not an organizer, which makes for economy in the story. Stallworth does not have to go through layers of the hierarchy to get to the leadership. 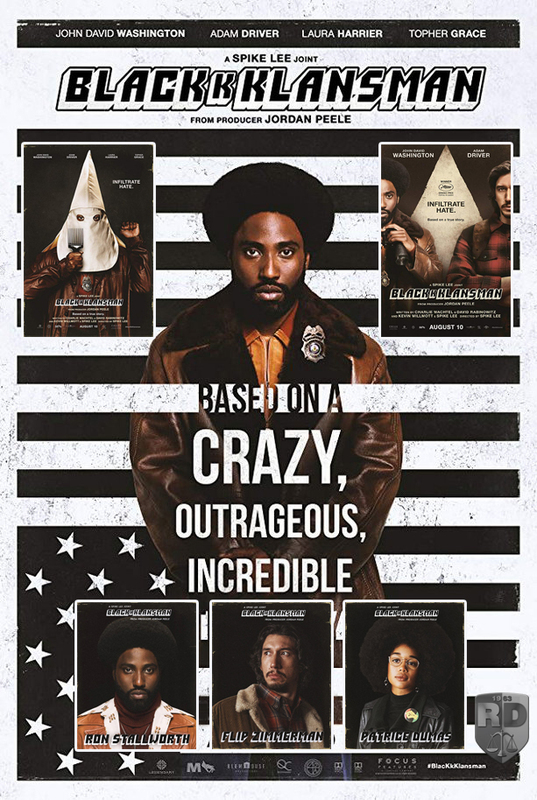 As in real life, in the film, Stallworth (John David Washington) partners up with a white, Jewish undercover cop, whom Lee calls Flip Zimmerman (Adam Driver), to stump the Klan and bring it to justice. Stallworth’s is the phone voice; Zimmerman’s is the body that attends meetings. Between the two of them, and most of the rest of the police department, they contrive a scam so effective that an official Klan membership card is issued to a black man and flashed by a Jewish undercover cop. The compound black/white cop, one way and another, make a fool of David Duke (Topher Grace); save the lives of a crowd of earnest, young, black militant students; and save from a Klan bomb plot the life of an old, black civil rights hero, Jerome Turner (Harry Belafonte), who tells a heart-wrenching story (true) of the old south to a group of horrified young, black students. They also prevent a cross burning and finally bring to justice a racist cop who has previously been protected by the blue wall of silence. But the film is not just an upbeat policier, Colorado style, with a message for us about how hatred can be checkmated when well-meaning Americans get together. Three cheers? Nope, many questions. The narrative is built on a collision between a liberal story about social problems and a frame that comments on how racially charged events are filtered and effected by the mixed messages about race conveyed by the white establishment and by media promotion of images and scenarios. Blackkklansman is filled with satiric humor, and good music, as well as action sequences. However, its main force lies in its depiction of the absurdity of human beings dedicated to hating and killing and the appropriateness of police measures that use a surreal legal strategy to fight the equally surreal—and despicable–spectacle of grown men committing unspeakable crimes against humanity while wearing clownish white robes with pointed hoods. The surreality of this American version of hatred and ignorance is emphasized by the the way the action is framed. Lee’s artful film, unlike Stallworth’s realist book, does not begin with our hero’s initially whimsical contact with the local Klan chapter, but rather with the famous scene from Gone With the Wind in which vixen Scarlet O’Hara (Vivien Leigh) rushes to a make-shift, chaotic battlefield hospital to find a doctor for her saintly friend Melanie (Olivia DeHavilland). Melanie is having her first child as the war rages. The glory of the scene is the way the camera begins with a close focus on Scarlet and moves relentlessly back until she is barely visible in a sea of bloody, broken soldiers. What a way to tell us how delusional she is about her self-importance, since it is clear that, to quote Casablanca, she and Melanie don’t add up to a hill of beans in a broken and bloody America! It’s actually one moment of truth in a racist spectacle that most of the time uses the Civil War as the backdrop for a glamourized sado-masochistic love affair. But what is Lee telling us by making this our first encounter with the Stallworth story? I’m not sure I know; there is no programmatic clarity to this rhetorical strategy and I like that. It belies the cliched responses to Spike Lee’s work that rate it as propaganda. If we really take Lee on his own terms, he is giving us room to ponder the relationship between the image of Scarlet in the battlefield hospital and the story of a black Klansman. It makes us active viewers, rather than a spoonfed, passive audience. I venture that you can come up with some pretty interesting ideas about this juxtaposition, and I’ll take a guess at Lee’s rhetoric below. This prompt to wonder and thought is compounded when the opening image from Gone With the Wind is followed, not by the Stallworth story, but by yet another framing element, a montage of one (fictional) Dr. Kennebrew Beauregard (Alec Baldwin) making a viciously ignorant and hateful documentary short to support White Nationalism, his initially composed face and voice juxtaposed against news footage of the integration of schools in the south. Suddenly, Beauregard turns surreal, his voice a manic discontinuous collection of fragments of words and gutteral grunts, and he is visible against the background of some of the most racist footage from Birth of a Nation (1915), the lighting on his face mimicking the colorwashing of the black and white frames of D. W. Griffith’s seminal narrative film. Lee asks us to begin our journey with him by moving from this altered state of metacommentary into the realism of the Stallworth story. And he doesn’t stop there; he returns us to an altered state shortly after Stallworth’s victory over the Klan. Lee plunges us back into surreal images and feelings at the end of his film when after, the success of combatting racism through the teamwork of Stallworth, Zimmerman and the department, Chief Bridges (Robert John Burke) disbands the team and the operation, commending the men for excellent work, but saying there is no further “credible threat” of racism in Colorado Springs. This, of course, echoes the language used by Chief Justice John Roberts when he wrote the majority opinion gutting the voting rights act. No credible threat. It’s a surreal conclusion to come to based on the facts as they are. And—now I’m making my guess about why the Stallworth story is framed in this provocative way– as I see it, Lee is determined to make us see and feel that the way the powers that be both fight and refuse to fight racism is anything but realistic. Not just think virtuous thoughts, but see and feel in a new way. It is bracingly destabilizing. 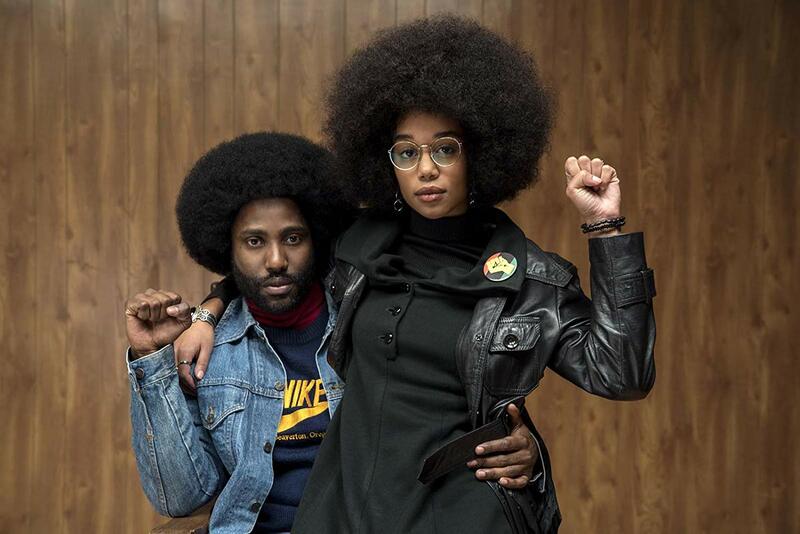 The last time we see Stallworth, he is with his girlfriend, Patrice Dumas (Laura Harrier), a lovely black woman committed to “the liberation of my people,” and there is a knock on the door of his apartment. It is both real and symbolic. There is a real door and a real knock, but suddenly the time/space dimensions change and Dumas and Stallworthy defensively raise their guns against whatever is trying to enter the apartment, and they find themselves pointing their weapons toward an invisible target– at the audience, in fact–in a hallway of infinite depth growing through the magic of the movies both in front of and behind them. It is, in its way, a mirror image of the “dolly out” camera work from Gone With the Wind with which Blackkklansman began. Where are we? In the psychic space of black Americans who do not feel themselves to be on steady ground in a knowable environment. Lee eschews coming to closure with some cliched, righteous statement, and instead gives us the experience of our fellow black Americans. It is a brilliant, modernist stroke of narrative artistry. If the media can be racist, they can also fight racism, but not using business as usual. Like the unexpected eccentricity of Stallworth’s sting. But we have a long way to go achieve our ideals. Lee then cuts to a (fictional) cross burning and then to (real) news footage of the violence caused by the 2017 White Nationalist march in Charlottesville, Virginia, and Donald Trump’s astonishingly Nazi-sympathetic response to it. Speaking of surreal: the president of the United States is a Nazi fellow traveller. Tell it to the marines, who fought and died in World War II to stop Hitler. No credible threat, indeed. The madness of such a statement. The last image is of the American flag upside down.